It’s no secret that Milwaukee is a meat and potatoes town, Midwesterners are a hearty bunch and we like a hearty meal. Throw a slab of nicely charred cow on someone’s plate and watch their eyes go wide as the “MEAT” synapses fire off in their brain. 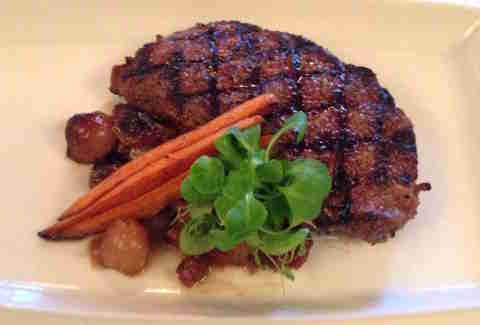 Stop into any of these 10 local steakhouses for a meal that will leave you in carnivorous bliss. This is the steakhouse to see and be seen at, possibly brushing elbows with a celebrity or Packers linebacker. 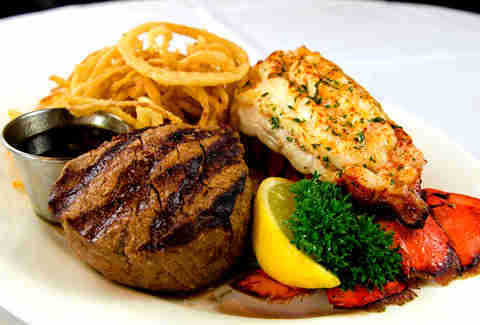 Don’t be intimidated, there’s bound to be plenty of couples celebrating their anniversary with oysters and filet. This is also one of the few places you can get amazing Japanese Wagyu beef and at “market” price (which, yes, means expensive). 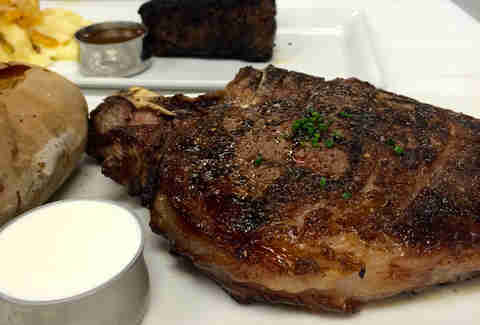 The biggest, baddest steak you can get here is a 20oz bone-in ribeye. 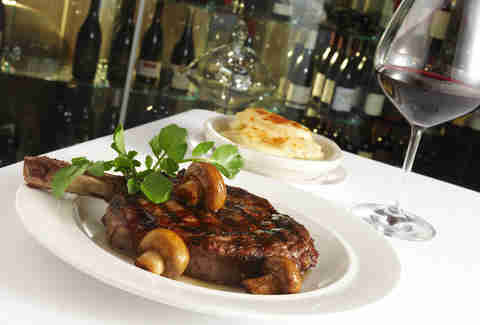 It’s dry-aged for 75 days, concentrating the flavor into a beefy mélange, prized by many. The restaurant has plenty of fancy schmancy credibility with stone crab claws flown in from Florida (in season), creamy Spanish gazpacho with lobster, and bistro classics like steak frites. If Don Draper were real, visiting Milwaukee, and not already dead five times over thanks to his lifestyle choices -- he’d totally eat at Five O’Clock. It's been searing up porterhouses and bacon-wrapped filets since 1948 and is still going strong. Get the retro filet oscar, topped with asparagus, crab meat, and hollandaise alongside a Sazerac. If you want to feel like a caveman for a night, gnaw on the 32oz Wagyu tomahawk ribeye. It gets its name from the comically large rib bone that’s left on, making for some kooky selfies with a $92 steak. Also oversized: the chilled seafood tower, with shrimp, king crab legs, and mussels overflowing from a giant martini glass. This little duplex-turned-steakhouse sits on a corner lot in a residential neighborhood, and you’ll feel like family as soon as you walk through the door. 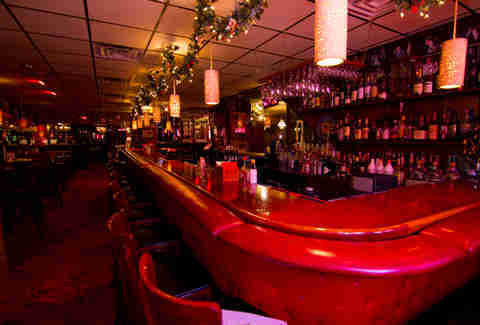 It’s got about a dozen tables and a bar that’s always full of regulars waiting to order a steak with a deep, dark crust. The filet mignon, topped with a whole portabella and roasted garlic cloves, can’t be beat, but the scallops are first class if you’re in the mood for seafood. 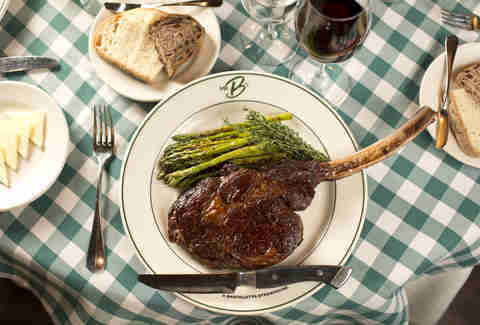 Part of the Bartolotta restaurant empire, Mr. B’s cooks its steaks in a wood-burning oven. That gives them an all over sear and infuses them with wood smoke, taking you back to that time your dad took you camping when you were 12 and burnt the steaks. 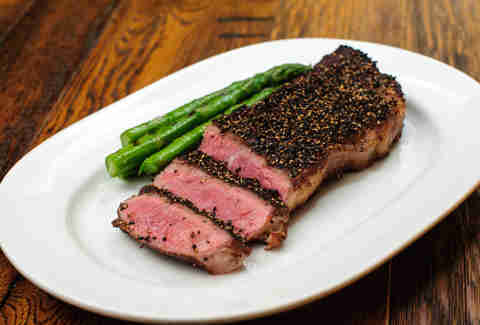 Luckily the chef here is a little more skilled, so your 16oz NY Angus strip will be a perfect med-rare. Don’t let the cacophony of slot machines and bingo callers distract you from finding your way to this steakhouse in the Potawatomi casino. It’s much better than you’d expect a casino restaurant to be; it even makes its own charcuterie and cheese. 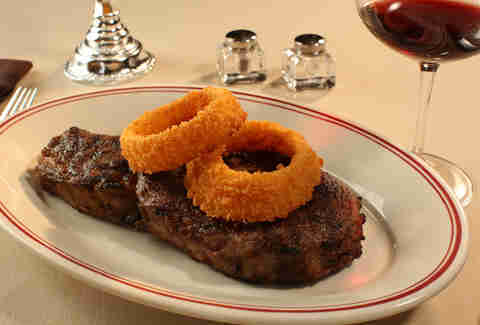 Of course you could get the usual filets and ribeyes, but you should try the lean kangaroo steak instead. Because where the hell else are you going to get kangaroo? 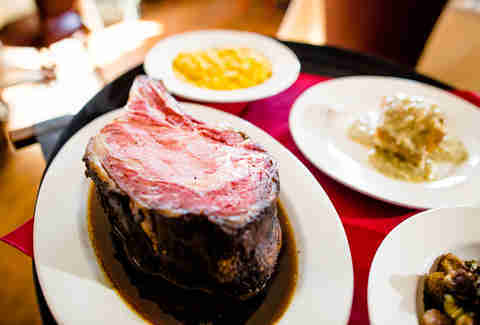 You go to Ward’s for one thing: prime rib. The smallest, wimpy cuts range from 8 to 24oz. Above that, they’re named for the people who first conquered the meaty mountain. The largest is 168oz and is called the Awesomefat-The Michael Litman Experience. Because presumably, you’re going to have quite the experience in the bathroom the next day if you try to eat more than 24oz of beef. The Packing House is a supper club that’s been around since the '70s, but has had a facelift and is once again a happening place to be for people under 60. 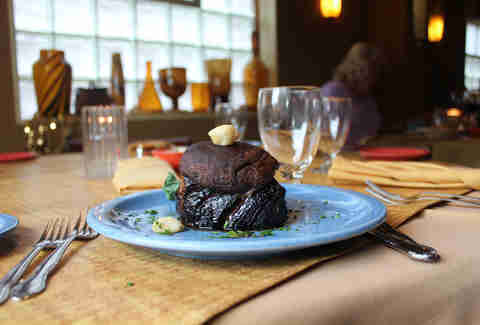 The menu is pure supper club, with steak au poivre, beef Wellington, prime rib, lobster thermidor, and escargot. After dinner, escape to the bar for a Grasshopper while the lounge singers serenade you. This is a no-nonsense kind of steakhouse. You pick your cut of beef, your upgrade (real men don’t need truffle butter), and your a la carte sides. If you prefer your steak raw, you can get a carpaccio appetizer with Parmigiano, aioli, capers, and arugula. 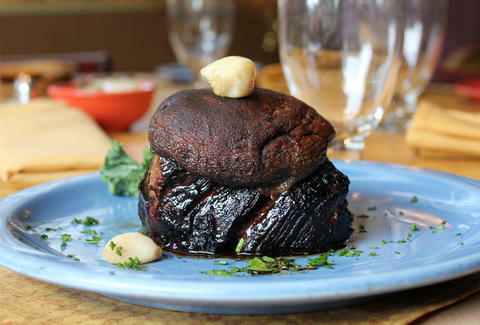 Even if you’re wary of trusting raw meat at a restaurant, this one definitely makes the cut. Lacey Muszynski is a Milwaukee food writer who is now craving a little surf and turf and some au gratin potatoes, thank you very much. Follow her on Twitter: @worthhersalt.